Scott Frazier is a freelance photographer based in Bartlett Tennessee specializing in action sports photography. 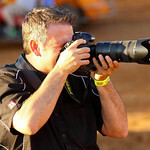 Scott has shot USCS ASCS, MSCA, Power-i, CCSDS, ARCA, MARS, All-Star, USAC, WoO, USA-BMX events, and also covers events for National Speed Sport News Magazine, OneDirt Magazine, MSR Mafia, and other dirt track racing publications. Scott uses Lumedyne Flash Systems and Nikon bodies, Flashes and Lenses.